I am still waiting for my dice, which is supposed to be here by Monday, my D&D starter set and all my miniatures, which will be here on Wednesday. In the meantime, I thought it would be prudent to start putting together the Wilderness tiles. These are really difficult because there are so many pieces that are pretty busy heh. They are 2 sided and some of them are just plain old grass with rocks and trees on them, but there are also some pretty neat tiles with towers and houses and huts. There are more than a few tiles of fires, which I assume are all trees on fire, but I won’t be using those because they are too busy. Although, I may use one burning bush to add a element of danger. We’ll see. The thing I love about these tiles is that they are so colorful and thick and hard like a regular board game. The thing I hate about the tiles is that they aren’t interconnecting like a puzzle. The reason is because they slide around the table so much and it’s difficult to keep the pieces together. If I were to start playing with this, I would have to either hold my breath every time I move a miniature, or buy one of those rubber liners you put under rugs to keep them from sliding around on the hardwood floor. I think the latter. I’m not sure I like layout that I have chosen so far, but when I buy a rubber rug liner, I’ll redo the whole thing so it doesn’t look so busy. I am not quite sure how I will place the pieces though. 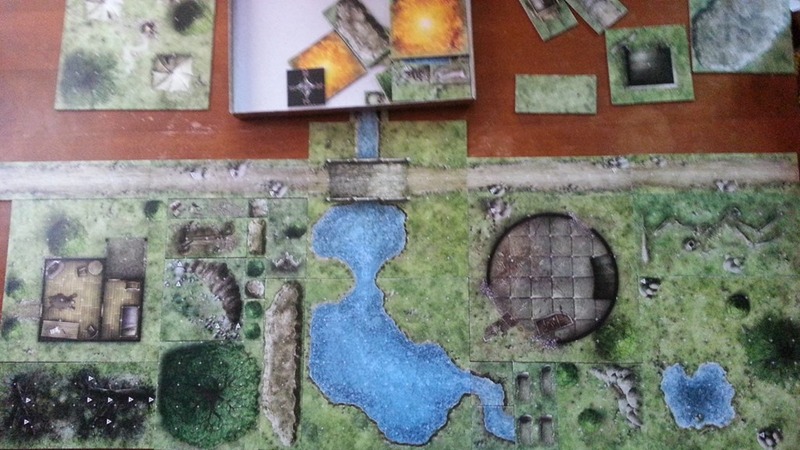 I tried to Google the Dungeons & Dragons wilderness tile set and I found a bunch of pictures and a few YouTube videos, but they were basically unboxing videos where they said “Oooh I’m opening a box. Oooh look at the tiles.” Okay so they didn’t say ooh, but you know what I mean. The pictures didn’t have any finished boards, so I couldn’t really see how other people put their tile set together. I would love to get some inspiration, so it would be awesome if someone showed me how they put theirs together. Of course I won’t copy theirs, I just want to see how I can improve mine. There is still a lot of time before I get my packages, but I would like to have this tile thing finished before then so I can dig in to my new adventure so I can get a head start on my book.